The Hollywood adaptation of Stieg Larsson's The Girl With The Dragon Tattoo is filled with ambiance but otherwise cannot fully justify its existence. In Stockholm, Millennium magazine investigative journalist Mikael Blomkvist (Daniel Craig) is found guilty of libel for wrongfully accusing wealthy industrialist Hans-Erik Wennerström of fraud. Mikael is carrying on an affair with his editor-in-chief Erika Berger (Robin Wright), but leaves her behind to accept an assignment from elderly business tycoon Henrik Vanger (Christopher Plummer), living in the remote northern island community of Hedeby. Mikael in unaware that his background had been thoroughly checked by young hacker Lisbeth Salander (Rooney Mara) on behalf of Henrik and his lawyer Dirch Frode (Steven Berkoff). Lisbeth is an extremely intelligent but deeply troubled ward of the state, waging a battle for survival against Nils Bjurman, her horrifically abusive state-appointed guardian. Henrik wants Mikael to investigate the disappearance 40 years prior of his great niece Harriet. In return, Henrik promises to reveal the real dirt on Wennerström. Henrik also warns Mikael that the extended Vanger family includes plenty of squabbling relatives, long-held grudges, vendettas and a sprinkling of Nazi sympathizers. The Vanger clan includes Henrik's deceased brother Gottfried (Harriet's father) and Gottfried's son Martin (Stellan Skarsgaard), who now runs the business, while Henrik's other brother Harald is ailing but still clinging to his fascist views. Mikael sets up shop in a cold cabin and starts delving into family archives, police records and old newspaper reports. He finds a cryptic code in Harriet's Bible, and Frode connects him with Lisbeth to help advance the research. Mikael and Lisbeth join forces, start a passionate affair, and gradually uncover a horrific trail of crime much more complex than they ever expected. Directed by David Fincher and arriving two years after the Swedish version, this Girl With The Dragon Tattoo exists in the name of avoiding subtitles. It's otherwise difficult to understand the artistic logic of imposing Swedish accents onto Anglo actors and recreating the same movie. Michael Nyqvist as Blomqvist, Noomi Rapace as Salander and director Niels Arden Oplev did a terrific job the first time around. Fincher adds a bit more style, subtracts some heart and plot comprehension, and lands in the same place with less authenticity. Nevertheless, plenty of impressive visuals are on display. From the Bond-inspired opening credit sequence to the stark, frigid landscape of Sweden's remote north, Fincher creates an environment where things happen at the speed of creeping ice, and secrets lurk beneath a family's dominant blanket of power and wealth. Back in Stockholm Lisbeth dances on the edge of madness, her survival instincts kicking into overdrive in her morbid battle of excessive brutality with Bjurman. 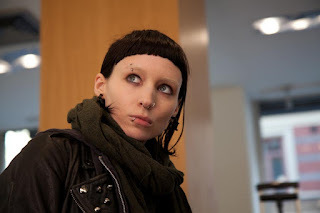 The material is strong, and Fincher extracts a stunning punk performance from Mara, Lisbeth Salander a brilliant source of coiled and angry energy. Fincher does however bungle the central mystery of Harriet's disappearance. Too many names and locations are thrown at the screen far too quickly, and Fincher moves on to capture the next frozen pond instead of allowing the plot and supporting characters to breathe and mature. The Girl With The Dragon Tattoo does convey the layered impact of individuals victimized by power brokers, personal tragedies covered up by a veneer of civility. But despite the professional treatment, this remains a wholly unnecessary remake.